This interactive presentation contains the latest oil & gas production data from 65760 horizontal wells in 8 US states, through August. Cumulative oil production from these wells reached 5.8 Gbo, while cumulative gas production topped 48 TCF. Oil production from these wells dropped significantly in August, as the Eagle Ford and the Bakken declined together by about 100 kbo/day. Gas production was stable at close to 35 BCF/day. In the “Well quality” tab we can see the production curves for all these wells, averaged by the year in which they started production. 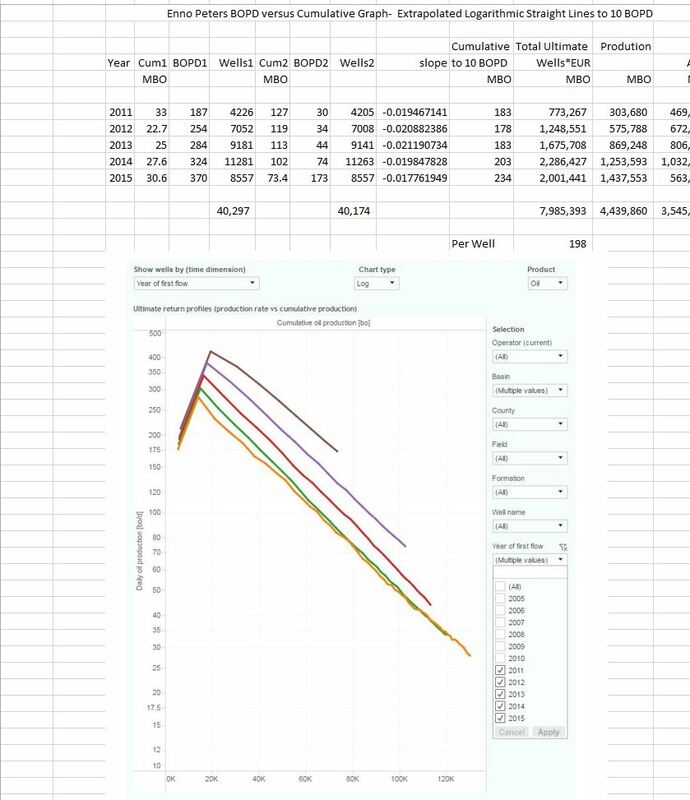 I’ve made the following change here: the thickness of the curves is now an indication for the number of wells that are included (the exact number of wells is shown in a tool tip if you click on a data point). My aim with this was to provide a visual cue of the relative weight of these curves. If you have a strong opinion about whether you like or dislike this change, please share it. We can see a thinning at the end of the tails, as not all the wells from that year have reached that particular age (in months on production). 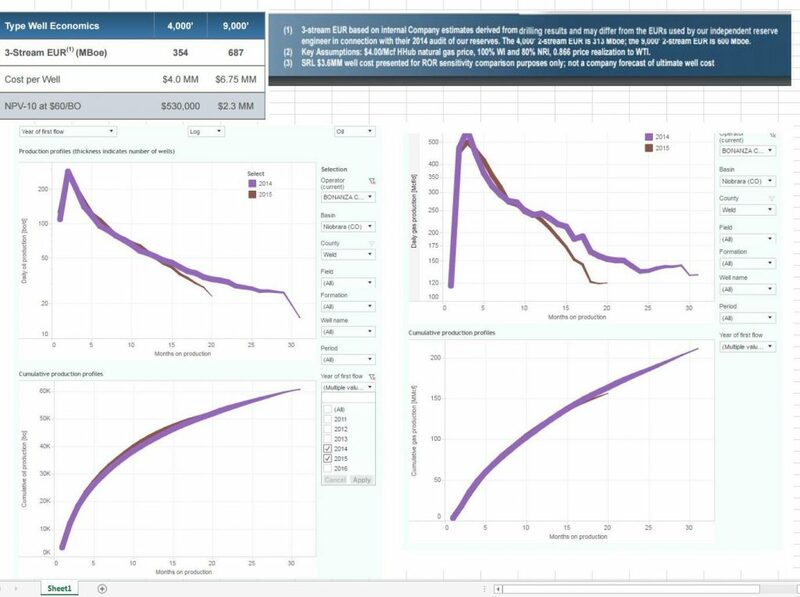 All oil & gas basins are included, so if you want to see the performance of a subset of these wells, you can use the selections at the right side of the screen. The status of these wells can be viewed in the “Well status” tab. Where more than 1400 new wells were put online in December 2014, since April this year the number of new well additions per month hovers around 400. Due to much fewer completions, average production from these wells has dropped as well. The bottom graph shows that almost 70% of these wells are now below 50 bo/d. Excluding the gas basins, this group still contains almost 60% of the wells. This “Ultimate Return” overview shows the relationship between oil production rates (y-axis), and cumulative oil production (x-axis), averaged for all the wells that started production in a specific quarter. I’ve only selected the basins where oil production is dominant. We can see nicely here that newer wells have higher initial production rates, and that this relationship between production rate & cumulative production after this period is remarkably similar as earlier wells. Using the “Operator (current)” selection, you can view these ultimate return profiles for individual operators. The last tab (“Gas Oil Ratio”) shows how gas production has changed relative to oil production. The blue graph in the bottom chart (the overall Gas Oil Ratio) shows that relative gas production was very high in early 2011, and after bottoming in early 2015, has moved upwards again. I always appreciate feedback on these presentations. So if you have any remarks, or find some of the overviews not intuitive, please let me know. I’ve not yet planned a next post, and will update the text here once I do. Texas Railroad Commission. 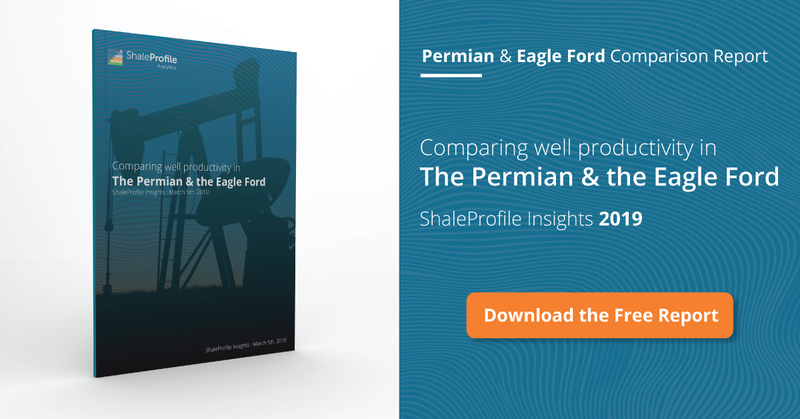 Well profiles are estimated from well status & lease production data, as individual well production data is not provided. Here is an extrapolation of the logarithmic straight lines in the rate versus cumulative presentation to 10 BOPD. Indicates 40,000 wells from 2011-2015 generated EUR of 8 billion barrels. Close to 400 billion dollars all in to result in starting cost of $50 per barrel. Net it up from there for royalty, transport, adval and severance tax and operating expense. Interesting work Jim, thank you. Your last projected US shale production synopsis showed by year EURs of 2011- 184 2012-184 2013- 184 2014-199 2015- 209. With the exception of the 2015 result, great agreement. Great to hear that Jim. Part of the differences are caused by projection errors, but also some of these can be explained by some changes in coverage. For example, I now include Wyoming as well, which was not included in that Projections post. Also, at that time, I missed individual production histories for some older Bakken wells. When I will do a next Projections post, I will give a reference to my previous post, and also try to give a list of changes in coverage. I think if we keep doing this Six Ways to Sunday; the iterations will converge. Interesting to see that a number of plays (E.g. Eagle Ford) are starting to see peak or declining EURs when looking at the individual county behavior (Average play EURs are up because of greater 2015/16 contribution in strong counties). I’d be curious for the other plays like the Bakken and Niobrara where EUR has increased… if this is due to improved completion performance or simply due to longer laterals. Not sure how intensive it would be to pull all the lateral lengths for this data set (probably pretty tough), but it would be incredibly useful. Even high level (E.g. Bakken average lateral length up 10-25% for 2015 vs. 2014) would be very important context. I also regularly check changes of well productivity in smaller areas, to isolate results from changes in drilling focus (e.g. moving in/out of sweet spots). I found using this way that some areas already show signs of lower well results (Mountrail & Karnes are examples), while in other areas productivity is still rising. Indeed it would be interesting to compare this with changes in lateral lengths. Unfortunately, not many states share this data, although for North Dakota I can make good estimations. I may be able to share this in the future. TX provides a means to “determine” the lateral lengths but it will be a bit labour intensive. I can share the portal, how one would go about determining when the lateral went “in zone” and then final take point but I do not have the time to physically do the By-Well calcs for you. I do agree an EUR/completed foot of lateral is the Cats’ Meow for this exercise tho so I will be very supportive of you – in verbalized thought – if you are willing and able to undertake this exercise. Email me if you would have the time to do this and just need someone to show you how to get to these datasets on the TX RRC portals. Given my limited resources, it is not be possible at the moment to add another labor-intensive process to get these lateral lengths. I hope that at a certain moment this data will become available somewhere, in an easily accessible manner. 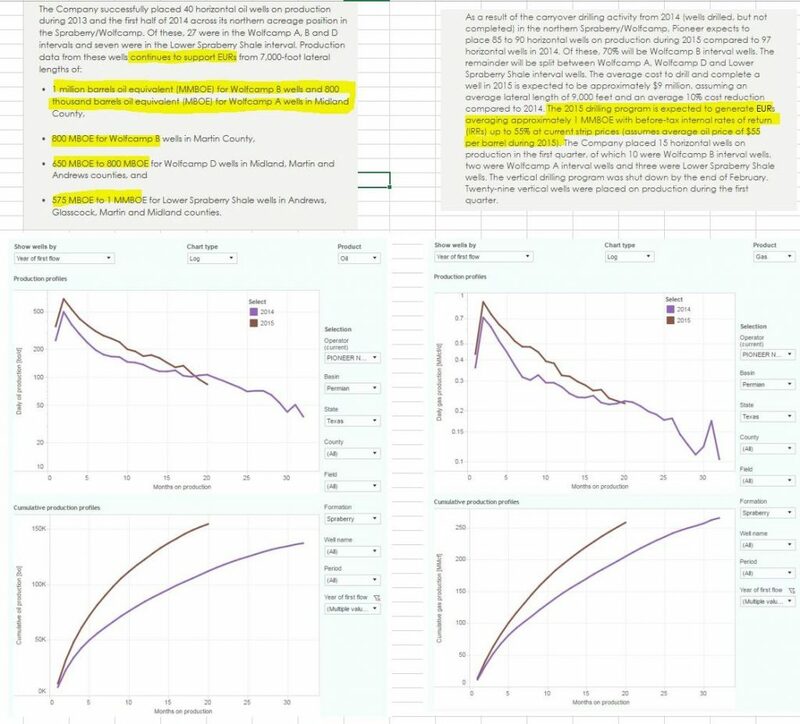 Below are screenshots of pieces of Pioneer press releases from 2014 and 2015 overtop Enno’s performance graphs for 2014 and 2015. In the more prolific Delaware Basin 30% of the production stream from the get-go is gas. Then, as we might expect in pressure depleted shale ‘containers,’ GOR starts increasing. Based on Enno’s data it does not take long either… and the rate of increase appears pretty steep. I think those shale guys out there are using BOE conversions and increasing GOR to build the type curves that give them 1.1M BOE EUR. Its some more slight of hand, if you will. Few grasp the role that BOE conversions at 6:1 have in the EUR prediction. Most of the time I think the shale oil industry’s porch lights are on, but there is nobody home. The gas is going to have to really get cooking in those graphs above to contribute 100 MBOE (600 MMCF). I know you know this, but the wells are so front-weighted in oil recovery, that the GOR ramp is muted absolutely as the barrels are so low at the time of blowdown- that the MCFs follow suit. I cannot believe the people on blogs who accept the 4 p reserves- proved, probable, possible and powerpoint; in light of the historical evidence as presented above. These guys are in a race against time as Enno Peters truthwatch runs. Mike – having checked Pioneer’s reserve booking, I think they booked ~600,000 boe per well on average in 2015; allowing for royalties, that equates to 750,000 boe per well of gross production. Has to be some sphincters puckered Ryder Scott and Netherland. For those that don’t know, those are blue chip PE firms. Part of me says this can’t be correct… that there is no feasible way that we shrooms in this deepest darkest din of web iniquity know what nobody else knows or is trying to hide. Enno is going to come out and say I have 4 times the active wells there actually are. But the longer this goes without contradiction, the damper that feeling is. Thanks for the reserve numbers. I know it isn’t as easy as it looks to mine this info. Did anyone else see that Bonanza Creek Energy filed bankruptcy on Dec 23? I believe they raised $200 million at $26 per share in a February stock offering. Below is a montage of their EUR claims in a January 2015 presentation with the overlays of actual well performance for 2014 and 2015. It appears to me that actual MBOE EUR of about 130 will fall somewhat short of their 354 claim. But I could be missing something. actually, it might be too hard or simple to predict shale gas/oil production declines. The conventional wells’ production declines usually follow so called Arp’s curve, and there is the the “b” factor, which describes how fast the decline is or determines the EUR. The smaller “b” is, the faster the decline. And based on hundreds of thousands of conventional wells’ performances, there should not be “b” over 1. However, the unconventional shale gas wells with lifetime over 8 years have proven that this “b” could be over 1, and this leads to hugely overstated EURs. In fact, the results in Marcellus and Barnett both proved that “b” is well over 1.2~1.5, and this leads to much higher EUR estimate. Put it in a simple and clear statement for shale gas (oil is different)— although shale gas has a much faster first 2-3 year decline comparing to conventional wells, the long term (over 5 years) production decline is not that faster than conventional ones, and in fact much slower. This results in overall higher EUR and lifetime for shale gas wells. Only history will tell what’s the realistic production decline and EUR is for shale gas wells. Another point: Shale gas with no liquids isn’t profitable at current gas prices, or even at significantly higher gas prices. Basically oil is the only reason shale is really being drilled. Gas needs to hit $4 for shale gas to be viable on its own in most places. But here’s the catch, which is horrible for shale gas producers: at $4 gas, it’s cheaper to produce electricity with a solar farm or a wind farm. And at that price it’s also cheaper to operate an all-electric home than one with gas. And solar and wind keep getting cheaper. And electric heat pumps keep getting more efficient. And so on. So, sure, there may be a lot of reserves. But they’re economically unrecoverable reserves (perhaps this is what EUR should stand for in future). I agree with Enno that Vanosedale dropped some wells probably due to the production was below commercial threshold? This will seriously affect the final EUR of the whole basin — much lower than what Prof. Engelder predicted, and I also overlooked here. But, with much higher IP and even the 3rd year IP still much higher than previous vertical shale gas well. AB wells should last a much longer time with 10MCFPD above commercial cut off line, the 7 year old wells on average have over 500MCFPD right now, and with “b=0.8”, it will be over 100 years when it dropped to 10MCFPD; and over 150 years for “b=1”. If you use 100MCFPD as the cut off, it will be over 30 years for “b=0.8” and over 100 years for “b=1” — I believe nuclear fusion will be displacing natural gas before 2117, and cut them out earlier? According to Enno’s data here, “b” is consistently over 1.5 in Marcellus, and with many of them over 2 or 3 for wells before 2011. This means if one extends it out 50 years, that well could produce 2->3 times as much as the first 3 years for wells drilled and put into production after 2014; the numbers could be extended to 3->5 times for wells done before 2012. So, if a well puts out 4BCF after 2014 in 3 years, there is a good chance it could have an EUR of 15BCF in 50 years. But, nobody has data for these shale wells over 10 years yet, with the exception of Barnett, and there some horizontal wells with lifetime over 10 years are testifying that this might be true. I hope those petroleum engineering courses you referenced would include your data and engineering ethics. The problem these guys have is their are a few of us dinosaurs left in the conventional business they have long forgotten about. Thanks to your work, we can start asking some tough questions. If you’re in the conventional oil business, It is time for you to light this board up. If you’re in the nonconventional business, it is time to speak up and defend your position. Mr. Brooker, thank you for your good work. Again, nobody pouring money into these shale oil plays seems to care about profitability or the dismal financial status of shale oil producers themselves, most of whom are essentially insolvent by every definition of the word. It appears, at least to me, that investment in unconventional shale oil is about reserve “growth” and the hope for higher oil prices. Anytime you, or anyone else, can blow a hole in EUR’s reported by these companies you are helping to diminish the reserve growth business model. The truth matters. Americans need for the shale oil industry to succeed but it is not going to do so by lying and its lies, particularly about its “assets,” are becoming more prevalent, and more outlandish every day. This Permian party better work; big, and it better work fast. If it doesn’t that’s the last gig for the unconventional oil industry unless it sells its soul to the United States government. Thanks. How do we connect up with the Art Berman’s of the world? A meeting/conference? “Nonconventional Ultimate Recoveries and Economics- Claims versus Realities”. Do we start a collection? I’m in for a grand. The documents (from 8 years ago!) hit on the same items you have here albeit concerning NG. Well, I suppose it’s more about getting big enuf and connected enuf that one does not have to answer for his/her premeditated frauds. And for some, it seems it is gonna work. The SEC has not prosecuted a single shaler for the ubiquitous frauds of PowerPt Type Curve Wells, the ridiclous reporting that sent Madoff, Lay and Skilling, Kozlowski, Ebbers, and others to jail, etal. They have begged XOM to reduce it’s reserves to resources considering they are only one to my knowledge not having done atleast some cosmetics on that front to date; although, NONE of the TBTF WS Public Portfolio IPOd PONZI Fraud Shalers, IMHO, have reasonably and accurately MarkedDown nor GAAP Accounted for the realities of their Biz Models of Fraud. They’ve made a mockery of our university trainings in Petroleum Reservoir Engineering fundamentals, as well as Messers Arps and Fetkovich life’s work, and acted as though Ethics are something only applicable to others. Even our industry group – SPE – has yet to post a single piece in its’ Technical Journal – JPT – suggesting there may exist a divergence betwinxt the 1+MMBbl EURs and posthumous actual Cumulative Recoveries. Inspite of clear evidence in the public realms to the clear contrary today. But Public CO PEs and CEOs can’t now expose themselves to what they knew, or damn well should have known, years ago as clear frauds now can they? So long as the SEC is only interested in persecuting private entreprenuers for having the audacity to expose the frauds and compete with TBTF WS Public Portfolio PONZI Fraudsters, not much will change in these Fascist States of ‘Murica. Hey, go buy some XOM Stawks. Theirs are the ONLY wells not affected by market prices seemingly and as such must be something really speshul. I suppose Rex could choose to take care of all the rest as SoS. SEC’s been off duty for over a decade now. They didn’t prosecute any of the crooks in the banking frauds which caused the crash of 2008. 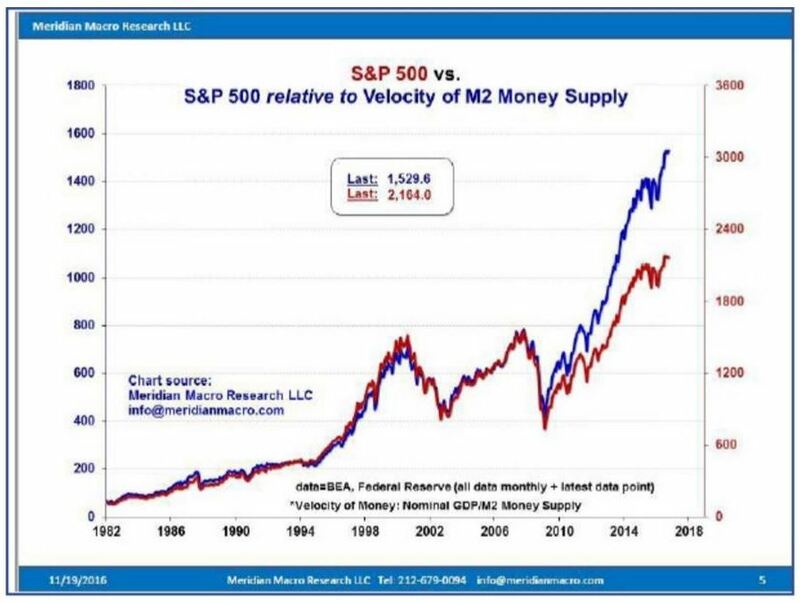 The chart below showing, IMHO the best PROOFS of the divergence betwinxt uderlying real economy (SP500M2 Adjusted) and the Financial Frauds in Shale and Public Industry at large (SP500), are the sorts of things that historically have forced Governments to remove their complicity with large, ongoing frauds of the general populace that always are sourced by TBTF WS and their IPO’d Public Fascist Corporations. These metrics are very representative of each, ie, the Real Economy and the WS (with USG Complicity) Fraud Public Mkt eCONomy. Look at the historical significance and agreements. Until 2009. One should ask themself what happened then? Are you calling for Greenspan’s Bernake’s, or Yellen’s heads? Or Wall Street? If you throw in Congress and the Senate, I’m in…..
Hello John. Thanks for the support and certainly the ongoing frauds could not have continued without Phil Gramm, etal’s complicity and legislation killing Glass-Stegall. Even Sandy Weill now capitulates and openly acknowledges his law-breaking at Citigroup that ultimately forced CONgress’ hand to create and pass legislation (Gramm-Leach-Blyly) legalizing his illegal existing acts, were bad for hte country. Gosh, who coulda known? I’ll tell ‘ya who – everyone who had paid any attention at all to what caused the first Great Depression, ie, TBTF WS Banks IPOing Public Portfolio PONZI Fraud COs, loading them with unpayable fiat Debts (created from literally “thin air” fractional reserve fraudnance) as they contemporaneously offloaded their Freely Acquired IPOd Equity onto Retail, and then it all hit the wall as it has in every prior experiment whether we are looking at late stage Roman empire or Weimar Germany. Except this time, we have large multiples greater in magnitude of Off Balance Sheet Banking Derivatives and suspension of M-t-M GAAP Accounting Standards that are gonna make the next implosion multiples greater hardships for US Citizens than the GD. Especially now that our CONgress Critters have declared in teh DEC 2015 Omnibus Bill that Derivatives are superior claims than Savers’ Deposits in TBTF WS Banks. Anyone who does business with TBTF WS Banks today, deserves the Bail-Ins they are gonna recieve when, not if, this all blows up! 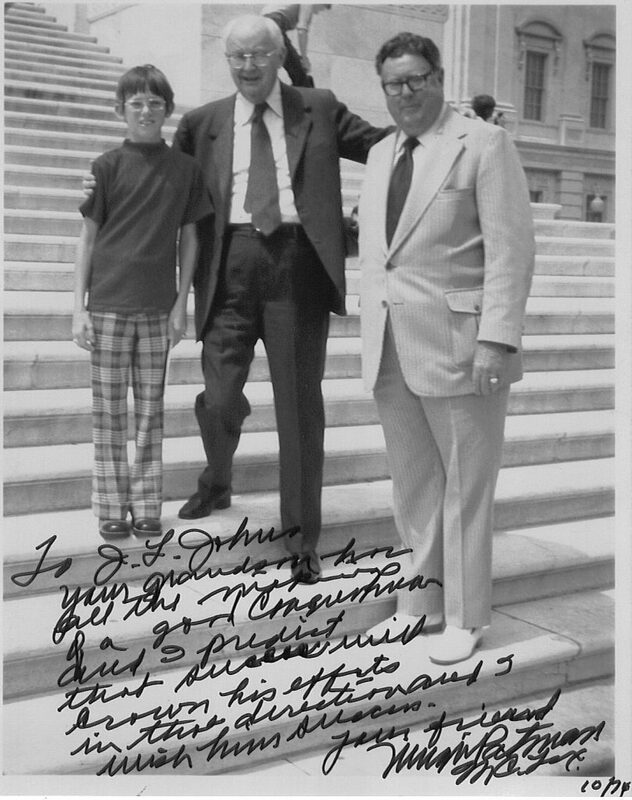 As a youngster 10-YO, my Grandfather served at pleasure of the last Honorable Congressman Wright Patman on his electrical subcommittee. It seems strange to recollect, but they were literally extending electricity for the first time into homes in Rural East TX via my Grandfathers’ Rural Electric Coop (where he served as GM) and others like. This is during MY LIFETIME if you can beleive it! My GF regularly attended meetings in DC in which he took his grandchildren. I vividly recall that Honorable Wright Patman (of Robinson-Patman fame that todays’ CONgress and AG allows be violated ubiquitously, alongside the balance of the US Commmerce Code Section 15 by HealthCare Cabal) pounding into my head that it was up to my generation to ensure the Banks remained restrained or our country would revisit another GD for the same reasons as the first. Well, we failed. Or they succeeded. But the result is the same. Nothing wrong with fiat money or fiat debt… Lincoln used it..
…if you’ve got a strong prosecutor preventing fraud. Great post Mark! It doesn’t feel like I all alone here. I prefer Free Mkt Capitalism the type we’ve not seen in 30+ years. But in order to get that, we must demand the Crony Capitalism that evolved into Full On Fascism post 2007 GFC, be dismantled, folks be held to account, and folks in Govt like the State and Federal AGs, be held to account when they openly state frauds and violations of law have occured, but refuse to prosecute in exchange for 7-FIgure per Year Salaries from those same Private Sector Public COs they refused to prosecute whilst under their sworn oaths of same in public offices. Happy New Year – Mark.